MISSION, KS--(Marketwired - Nov 1, 2016) - (Family Features) While the turkey typically receives all the attention at holiday gatherings, rounding out your meal with the perfect snacks, sides and desserts is the key to a successful feast. 1. Buy the right bird. Finding a turkey that's just the right size for your expected party is the start to a successful gathering. 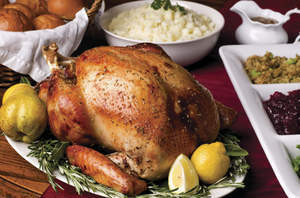 One common rule of thumb is to buy 1 pound of turkey per person -- so for a 10-person meal, purchase a 10-pound turkey. 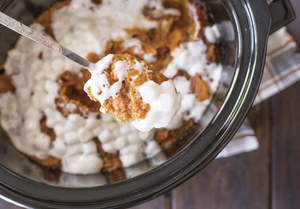 Don't forget that nearly everyone loves leftovers, so you may consider buying a few pounds more than necessary. 2. Be patient. If you opt for a frozen turkey, don't rush the thawing process. For larger turkeys, it can take days to defrost properly. 3. Timing is everything. Finding the right amount of time for your turkey to spend in the oven is crucial but not always the easiest thing to do. For an 8-12-pound bird, aim for 2.5-3.5 hours; 12-16 pounds for 3.5-4 hours; 16-20 pounds for 4-4.5 hours, and so on. The key is bringing the turkey to a temperature reading of 170 F.
4. Let it rest. Instead of pulling the turkey out of the oven and immediately carving it, give it a chance to rest for 20-30 minutes, which allows the juices to soak into the meat and moisten it up. 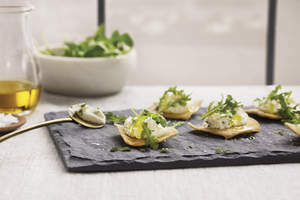 Award-winning chef Hugh Acheson created these gourmet, fuss-free NYC-Style Pita Chips with Herbed Ricotta and Arugula - featuring Stacy's® Pita Chips. Perfect for any holiday gathering, and with three simple steps, this snack evokes the colors and flavors of the season in a matter of minutes. Visit stacyssnacks.com for more chef-worthy holiday recipes and pairings. There's only one way to properly end a holiday celebration: dessert. 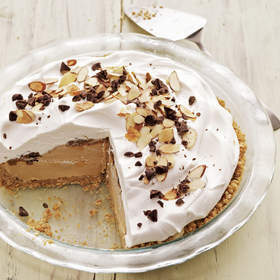 Send your guests home happy with one final course, a Caramel Macchiato Ice Cream Pie, to fill the remaining space in everyone's bellies. Find more dessert ideas at nestleusa.com/nestle-kitchens. To make crust: Heat oven to 325 F.